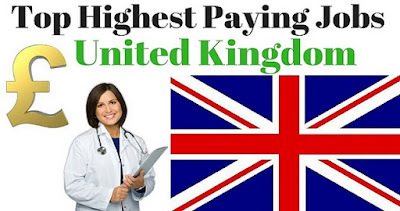 High Paying Jobs in UK without Higher Level Education . Although many high paying jobs in the UK are difficult to get without degree level qualifications or extensive study, there are a few industries in which it is possible to obtain a well paying position without having to be in possession of numerous certificates. 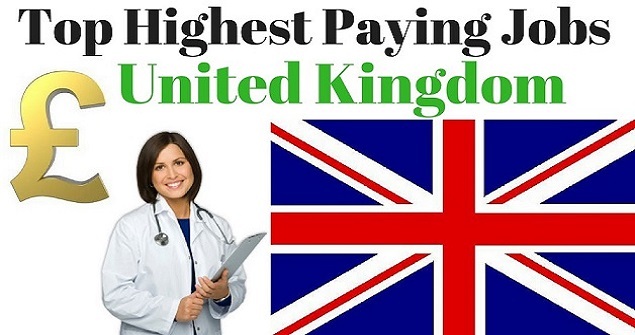 Here are some of the best high paying jobs in the UK that are accessible to those without higher level education. Air traffic controllers can earn up to an amazing £91,000 annually, with newly qualified controllers taking home around £50,000. Responsible for ensuring that airplanes traveling through the UK's skies land and take off safely, as well as for responding to any emergency situations, this is an extremely responsible and stressful job hence the high salary. In order to become an air traffic controller, you will need to attend an approved training course in order to gain the necessary air traffic control license. This can be done by applying for sponsorship and once this has been achieved, you will receive a salary of £10,000 while studying. Once the course has been completed, you will then complete further on the job training during which time, salaries will increase to around £25,000 - £29,000. Following successful completion of this training period, you will be a fully fledged air traffic controller and will be eligible in time for promotion to a more senior and higher paying role. If you have previous experience in retail and sales, you could become a sales or marketing manager without the need to study for a higher level qualification. Roles of this type can net you up to £100,000 a year as long as you have the necessary skills. A sales manager will lead a team of salespeople and there are many industries in which you can work, from telesales to the music industry. Although the starting salary for a sales manager will begin at around £18,000 there is almost endless potential for development and promotion. These positions also very often earn added bonuses and commission on top of the basic salary which increases take home pay considerably. To become a sales manager, you will need to start out as a salesperson and achieve an excellent record of target achievement. The only educational qualifications necessary are a basic high school education with a C grade in English and mathematics. Personality is more important, with like ability, an outgoing nature and persuasiveness being key. Once you have demonstrated your skills, the sky is the limit. Becoming a training manager is not as difficult as it sounds, and can command a salary of around £50,000 per year. A training offer will help people to improve in their employment by running training sessions. One of the key skills necessary for this job is to identify the skills that employees lack and how they can perform better in their role. The best way to get into this career is to start out as a training assistant, where you will receive a good grounding in the industry. Assistants can earn around £18,000 per year but will earn around £30,000 once a promotion is obtained to become a training officer. From there, it only takes one further step up the ladder to become a training manager. Working your way up the bottom can be done by gaining further experience, but if you want to progress more rapidly, you could take a professional qualification such as the CIPD. Many children have dreamed of driving a train as their dream job, so it is interesting to know that this is one of the highest paying jobs that do not require any specific qualifications. As a trainee, you can earn a minimum of £17,000 but once you are qualified you will automatically earn £30,000 with increases once you have gained further experience. As an added bonus, you will also get low cost or even free rail travel! To become a train driver, you only need a C grade in English and mathematics. You can find vacancies listed online and will be invited to attend testing centers to see if you have the aptitude to become a train driver. One way to get this job more quickly is to find employment within the rail sector in a different role such as maintenance, as frequently, drivers are recruited from within the workforce. The main qualification to become a customer service manager is to be friendly, outgoing and good with people. A customer service manager can earn up to £40,000 per year by helping customers to feel valued and by leading a team of customer service agents. The key to obtaining this job is to start out as a customer services assistant and then working up the ladder. There are plenty of opportunities in this field, with salaries starting at £18,000 and progressing with further promotions. Working for the police is a very desirable job. Not only is it well respected, it is also well paid and requires very little in the way of qualifications. A police constable can earn up to £50,000 with a starting salary at entry level coming in at £20,000. There are opportunities for desk jobs as well as patrolling the beat, making this a suitable job for all kinds of candidates. The only necessary qualifications are good communication and literacy skills, as most of the training is done on the job. Applicants must be aged over 18 and must not have any offensive tattoos. They must also be in good physical health. If you have a great idea for a business, this could be your opportunity to make unlimited sums. Setting up a company is key to making big money, and there are many charities and bodies now set up to help entrepreneurs launch their own enterprise. There are absolutely no qualifications required for this job, and many successful entrepreneurs have no degree and no high school certifications. Most important is a good business idea, although a qualification in business studies may be of assistance. Entry level firefighters earn around £21,000 per year and this goes up to around £40,000 with experience and promotions to station manager. Applicants for firefighting jobs must be at least 18, although those who are under this age can join a young Firefighters Scheme in their area which is a good foot in the door. The only necessary qualifications are 5 good GCSEs including English and Mathematics at grade C or above, however a good level of fitness is also necessary. Most of the training is done on the job.